My dual theory on villains. I’ve skimmed over some advice on creating villains in my recent spate of articles on characterization. But I’m gonna go into a little more depth here because depth is what makes a great villain. And without a great villain your heroes are going to be about as interesting as watching bowling on TV. The same rules that apply in creating every new fictional character go double for bad guys. While most of us identify with the hero because our hearts are pure (mostly) it takes more to get us to identify with the antagonist in a story. It probably goes back to ugly schoolyard incidents for most of us, huh? As usual, I have a theory on all this. I call it The Grand and Petty Theory of Villainy. You may think there’s all kinds of villains from the scary (Freddy Krueger) to silly (Batroc zee Lepair!) but there’s really only two. The Grand Villain is writ large. He walks the walk AND talks the talk. He’s no pushover and he usually really believes in what he’s doing. He’s often got big plans for the world and an army of henchmen to carry it out. He might have flaws but they serve to make him more interesting. 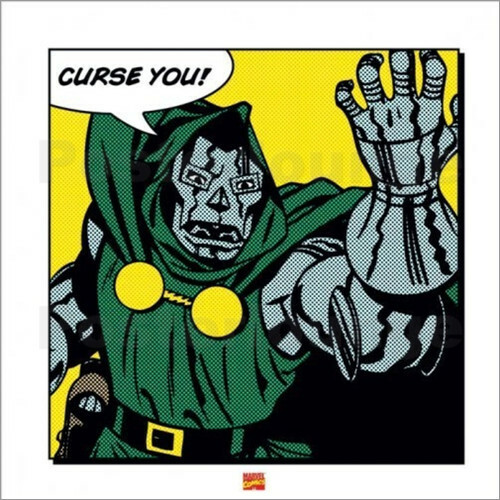 Doctor Doom is the best example of this. He has the castle, the riches, the army and the cool costume. He wants to make the world a better place for the Latverian people even if he has to conquer the whole darned planet to make that happen. His flaws are many. Beyond imprisoning himself in armor from head to toe he also has a severe mommy complex and can’t get over his rivalry with Reed Richards. So, this gives him a touch of the Petty Villain as well. The purely petty baddie is a cowardly bully who’s turned to the nasty side only because of his flaws as a person. This kind of badguy is the one we despise the most since most of us have met this type. (see ugly schoolyard incident above.) They’re people driven by fear or greed or stupidity to do what they’re doing. For the finest example of this kind of rotter I have to turn to movies. Small-minded punks are kind of thin on the ground in comics where most villains are cut from the grand or shallow variety. A two-bit thug with only negative character values doesn’t serve much of a comparison to define a hero. 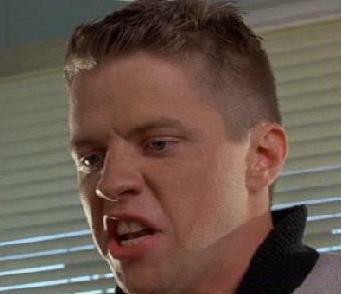 Biff Tannen is possibly the best Petty Villain in all of pop culture. The guy’s an icon. “McFly? Are you listening McFly?” He enlivens all three Back To The Future movies with a character both annoying and menacing. He’s every bully who ever lived. His motivations are simple. He’s lecherous, greedy, cowardly and stupid. He hasn’t a single redeeming value. He’s a grunting Neanderthal. He’s added to our lexicon; “Why don’t you make like a tree and get outta here?” And even though he’s shallow and boorish he carries the dark side and dirty work of three films on his back. Why? Shouldn’t a shallow character like this get tiresome after one movie? Not Biff Tannen. For the simple fact that there’s no bottom to his shallowness. He has the deepest shallowness of any character ever put on film. There’s no end to it! He’s beaten down through a time paradox and hindsight in the first movie and then turns the tables on our heroes using the same thing in the second movie. He even serves as his own mentor! And he uses the unlimited power given to him by the grandest of second chances to open a casino and abuse Marty’s mom! The guy has the power to alter destiny and doesn’t move any further from his motivations in the backseat of George McFly’s car! In the third film he appears as his own ancestor! He works as a villain mostly because we know and loath him for all the weaknesses we’ve seen in the villains in our own lives; those petty tyrants with just enough power over us to make us miserable. The folks behind the counter when you go to get a driver’s license. The guy at the drive-up window. The school teacher who hates his job and blames you for it. As further illustration (and an excuse to promote, promote, promote!) I’m gonna use two examples from my monthly comic BRATH. BRATH is a historical adventure set in a time very much like the ancient Roman Empire in the First Century AD when the Roman legions invaded and conquered Britain. Brath Mac Garen is a barbarian warlord who unites the tribes of his people to oppose the invaders. He’s thwarted in this by villains grand and petty. Priscus just wants everyone to love and respect him and has the world’s largest army to make this happen. He’s an unattractive little squirt with bad hair and undiagnosed manic/depressive issues. But he sees the Big Picture and understands the power of the mob. But somebody’s always stealing his limelight and he can’t help but get prickly about it. He’s kind of like Tom Daschle in a toga. On the petty side Brath has the Mac Dools. The Mac Dools are led by Vinn, their tribal chieftain. They’re mean and cowardly and stupid. Kind of like a whole extended family of Biff Tannens. The Mac Dools betrayed Brath by going over to the bad guys simply because they were jealous of Brath running the show. BRATH readers really despise them mostly because they’re no darn good. And every time they get a chance to redeem themselves they take the low road, the easy path, the coward’s way out. They’re determined to die a thousand deaths and always make the bonehead play. We’ve met Mac Dools our entire life and, if we were lucky, avoided them except at holiday dinners or sporting events. They’re the guys in the cheap section at the ballpark dousing women with beer and shouting obscenities so all the kids can hear. Other examples of petty villains? Draco Malfoy from the Harry Potter series. Judge Smails from Caddyshack. 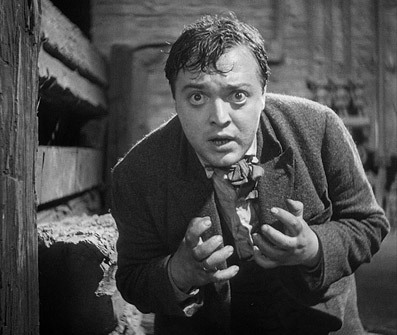 Almost every character ever played by Peter Lorre. The trick with the petty villain is to continue to make them engaging and avoid making them so annoying that readers tire of them. Like those aggravating slasher flick goons who should die already.